This was a highly controversial South African Air Force strike during the Second World War, and was held up by the German propaganda machine as an example of South African brutality firing on innocent passage liners with Red Cross markings (look closely at this famous medical neutrality marking on the funnels). The truth is however an entirely different matter and this strike was a legitimate one, well within the conventions. This was the Air Strike by 16 Squadron SAAF Rocket Firing Beaufighter Mk X on the Italian Liner SS Giulio Cesare in Trieste Harbour on 28 August 1944. Gun camera photograph show rocket projectiles on their way to the target. The vessel was successfully sunk. 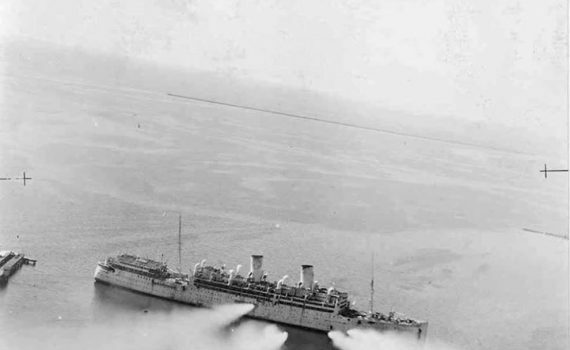 The truth is that after the SS Giulio Cesare’s brief service as a hospital ship it was pressed into a more sinister military role by the Germans as a port obstacle or port blocker to stop the Allies advancement in Italy – it was towed into position in Trieste Harbour and left there along with the SS Duilio, both ships had to be sunk in order to open the port. The ship was empty of any crew, passengers, patients and/or civilians and was identified as a legitimate military target. SAAF Museum Photograph copyright. Story for the South African Legion by Peter Dickens with additional inputs from Sandy Evan Hanes.